As the head cross country, track and field coach at Birmingham-Southern College, Kenneth Cox Jr. has achieved tremendous success. 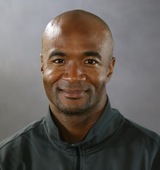 Cox received his bachelor of arts in communication studies in 1999 from The University of North Carolina and competed on the men’s track and field team in the 60 meters indoor, ranking fifth in the ACC, and 100 meters outdoor. He also walked on to the Tar Heel football team in 1997 and is a member of Phi Beta Sigma Fraternity, Inc. After leaving Carolina, Cox interned with North Carolina Amateur Sports and completed a summer as the assistant manager of volunteers for the Special Olympics World Games track and field events in Raleigh. In 2004, Cox served as the sprint coach for the Boys and Girls Track and Field Club of Metro Atlanta, and in 2006, he received his Fitness Instructor Training Association (FITA) certification and his USA Weightlifting (USAW) Club coaching certification in Olympic lifting. Cox said that the foundation for his success is his determination, discipline and faith. At UNC, Cox struggled at first and lacked the confidence to balance academic requirements with his athletic responsibilities, but he fought through his struggles to become a strong, independent, successful student whose confidence propelled him to take on the world. Cox credits the staff and resources at the Learning Disability Center for giving him the tools he needed to succeed in the classroom and beyond. The same competitive athletic spirit of hard work and determination helped Cox soar at UNC and in life. At Birmingham-Southern College, Cox’s accomplishments include being named Men’s Coach of the Year by the Southeast Region of the U.S. Track & Field and Cross Country Coaches Association in 2016, the Southern Athletic Association’s Head Coach of the Year for 2015 and 2016, and serving as second vice president for the U.S. Track & Field and Cross Country Coaches Association. He has received five individual national and 38 individual conference titles, 26 All-American honors and three regional athletes of the year. In 2017 alone, the Birmingham-Southern College Panthers received 27 all-region selections, 22 all-conference nods, 11 individual Southern Athletic Association titles, six national qualifiers, four All-American honors, two national titles and a conference championship. He has also coached five NCAA champions. Most recently, the men’s team finished its season ranked at a record-high 14th in the country. While the number of athletes Cox has recruited and their success in the athletic arena is notable, the growth of the student-athletes within the program is most remarkable. At Birmingham­Southern, Cox has served as a role model, mentor, leader and coach. He is not only a mentor to his teams, but also to a large number of African-American student-athletes who look to him for guidance. Cox also demonstrates faith and family values. Both his immediate family and his Birmingham­Southern family say that his bright spirit, passion, and love for helping individuals grow and excel are what set him apart. He has touched hundreds of lives and he enjoys sharing articles, news reports and press releases about his athletes so that others can share in their victories. His strong belief in God has allowed him to dedicate his life to showing younger generations how to face and conquer their challenges, especially those with diagnosed learning differences. His impact, however, goes far beyond influencing their college experiences. Cox models how to live a life of integrity, as a man, professional, husband, son, father and strong member of the community. Cox also gives back to UNC is as a member of UNC’s Learning and Writing Centers advisory board, where he works to raise funds for individualized support for all students, including those with unique differences. He also focuses his efforts to increase awareness of the value of these services for all students, especially those with diagnoses. He openly shares his story of overcoming barriers created by his learning differences through the help of these services.